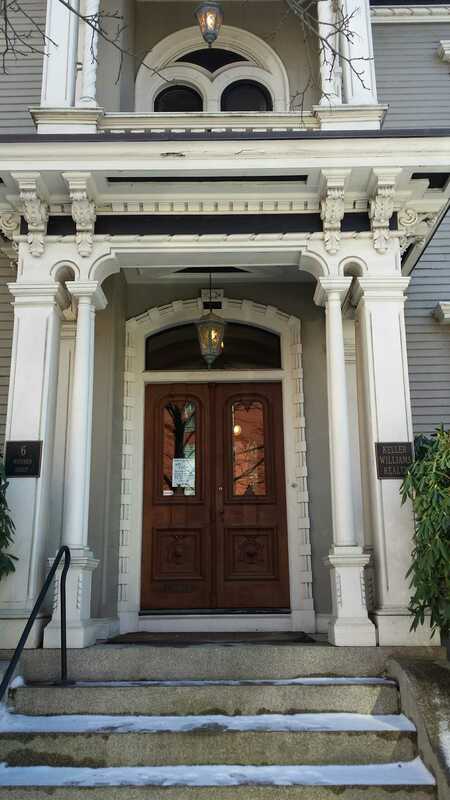 6 Deering Street. A home for an architect. Harding was an architect. 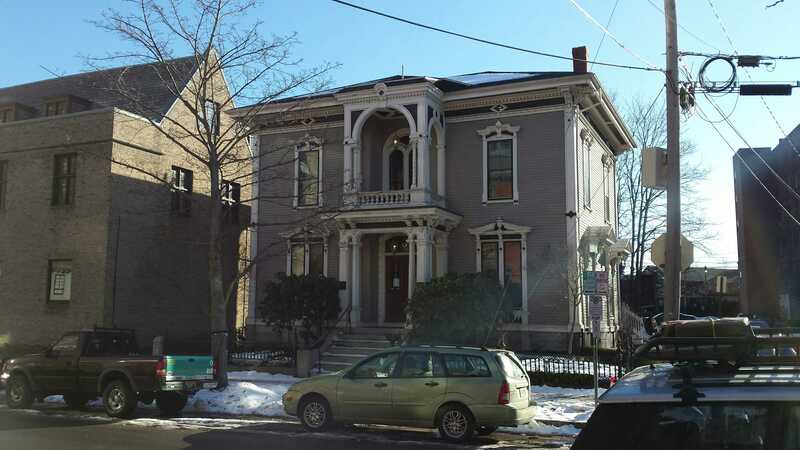 In 1873 he was listed as working from his home on Deering Street but I have also found biographical information placing him in Boston in the same year. It’s uncommon to see wood frame houses of this size in this neighborhood and/or era. That it survives relatively unscathed is even more unusual. Before my faithful readers start hitting the comment button, I know the tower has been Décapité. We shall get to that. The house is a simple 3 bay wide by 2 bay deep of modest proportions. Details are pretty thick. The entrance is via a 2 story porch. When I started writing it, this article was supposed to be a Glimpses and as such, under 400 words. Once I started down the rabbit hole of details on the house, I quickly disabused myself of the idea of 400 words. The details are all over the place from a stylistic view. The first floor windows are capped on the main facade with broken pediments with urns. Very Georgian. The deep projecting pediments over the side facade windows are somewhat Italianate but they sit on Queen Anne esque brackets with some funky drops. All this supported on pretty plain side casings running all the way to the water table. A photo from 1880 shows these windows having small ‘Juliet’ balconies. The corners of the building are weighty pilasters with a fine chamfer on the edges and a simple plinth detail at their bases. These pilaster are given a decorative band with greek cross detail at mid height. The second floor windows are as ornate as the first. Starting with stylized plinths, the side trim carries a plain surface to the head of the window. The head is capped with an odd, heavy molding with a mansard feel. These are quite unique forms. The wall is capped with a scroll work molding. The architrave is flat with diamond accent panels. This is capped with a dentil band. The cornice projects modestly and is bracketed at the corners. The entry porch is brimming with bits and bobs. Square pillars with a fine chamfer mark the corners. Inside of these are pairs of extremely thin columns with very plain capitals. They sit on hefty plinths with scroll worked corners. Above these, the architrave details carry from the main block. 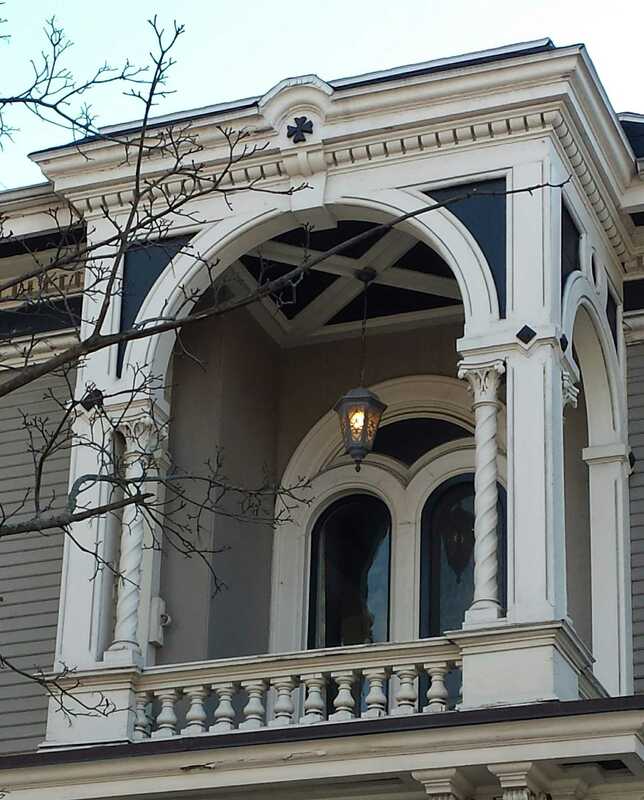 The scrolled and acanthus leaved brackets are paired and are overscale for the spot. The entry is through a handsome pair of carved doors with large lites. Above is a large arch topped window. This is all cased with a hefty molding with a segmented reedish detail that I am completely unfamiliar with. The second story features the same square pillars as below but here they rest on the corners of a low balustrade. The columns here are single, twisted and have Tuscan capitals. The pair are shortened and carry the spring point for a nicely sized roman arch. The spring points have a diamond detail at the center line of the pillars. Behind this is double window (door?) arrangement under an arched top. The ceiling of the porch has a vault detail. 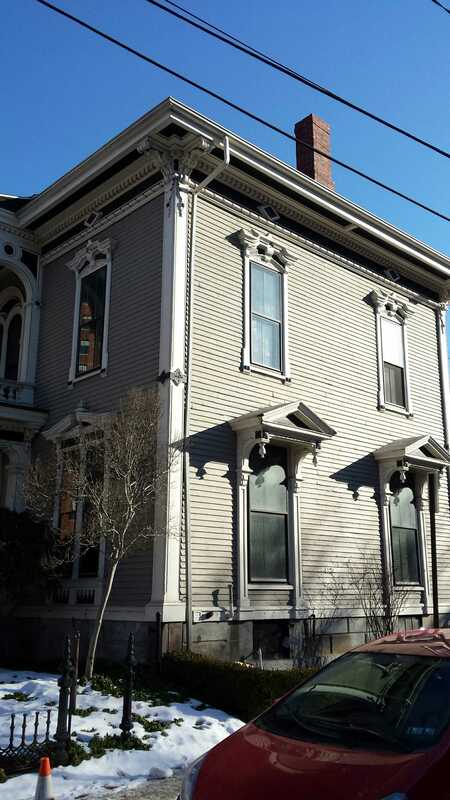 Harding sold the home to John Deering in 1873. This would seem to confirm that he had in fact moved to Boston by this time. 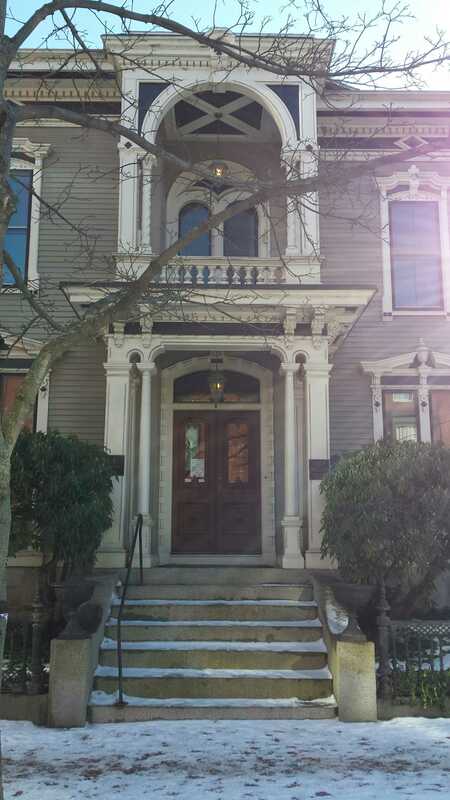 Deering sold the home in 1888. It changed hands via inheritance a couple of times before being sold to Helen Driscoll who was the owner of record in 1924. A photo of the house taken in 1880 and now in the possession of the Maine Historical Society notes the tower was removed in 1956. My suspicion was it was in such a state of decay that the decision was made to remove it. This is a shame as the loss of that verticality has left us with an ill scaled building. Another note, the Historic Resources Inventory listed the house as having ‘aluminum siding’ in 1976. Thankfully, it is now rid of it’s tin foil skin. Harding was originally from Massachusetts but moved to Maine in the 1850’s. His works can be found from Cape Elizabeth to Bath, Belfast and Yarmouth. 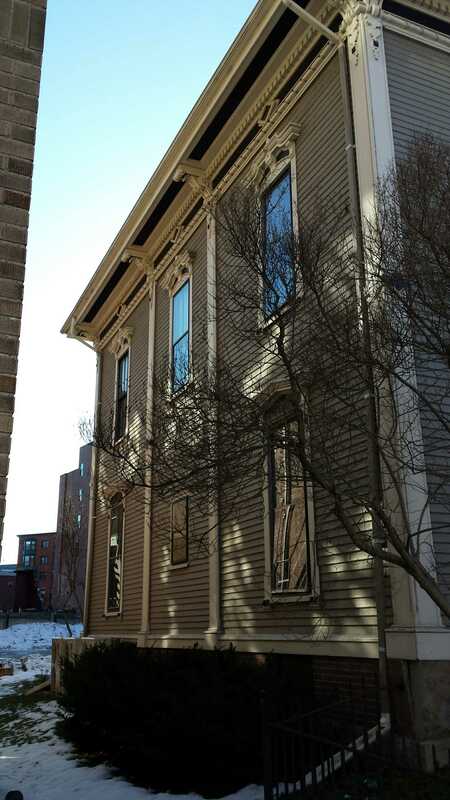 In Portland, his best known works would be the three buildings encompassing the block on the northwest side of Middle Street from Pearl Street to the alley next to 121 Middle. 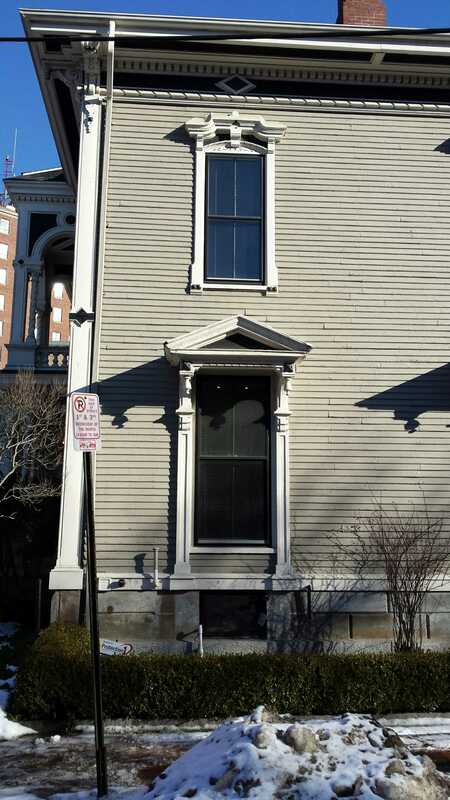 As he practiced out of his home, 6 Deering Street can be seen as a ‘billboard’ for his abilities. The house is now the office of a noted local realtor. 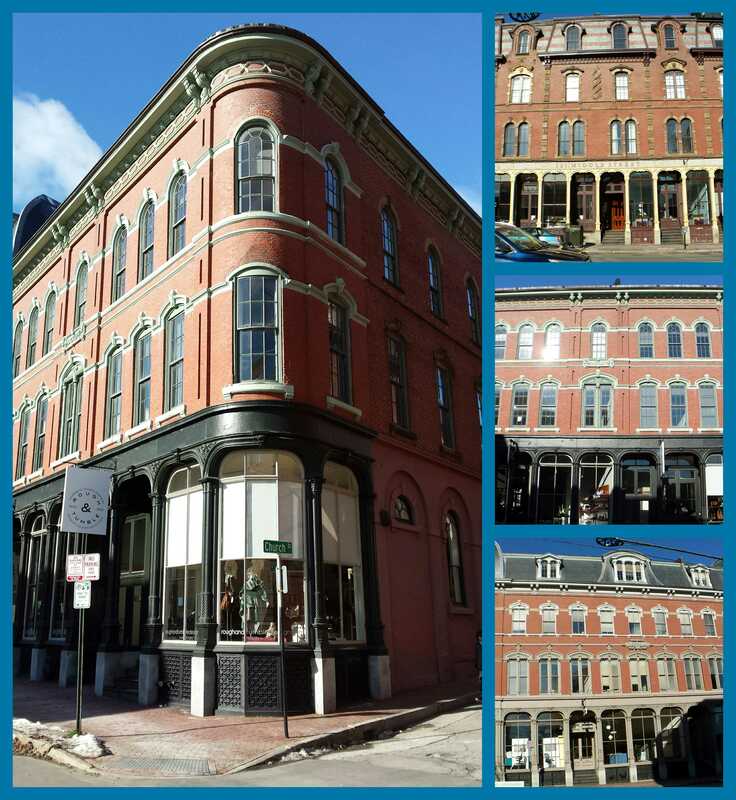 This entry was posted in Architecture, Commercial, Deering Street, Glimpses, History, Home of the architect, Images, Italianate, Parkside, Then & Now and tagged Architecture, George M Harding, Glimpses, History, images, Italianate, Maine, Portland, Portland Maine on January 24, 2017 by alewifecove.